After I enjoyed reading The Ice Twins earlier this month, I’m really excited to be reading S.K. 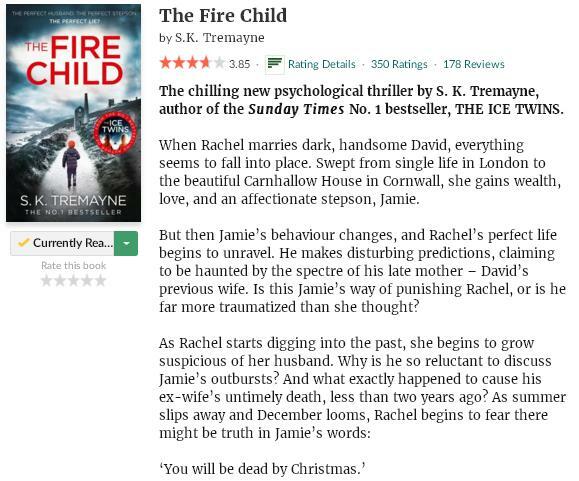 Tremayne‘s newest thriller The Fire Child. And so far the descriptions are just as good as in her first book! She is definitely excellent at setting a spooky atmosphere and I love the Cornish setting. I can’t wait to find out more about Jamie and Rachel. This entry was posted in Book Memes, Teaser Tuesdays and tagged book memes, s.k. tremayne, teaser tuesdays, the fire child by Yvo. Bookmark the permalink. I’ve just finished it and it’s without doubt a great psychological thriller. It’s one of my favorite genres, although this month I’ve read a lot more thrillers than normal since I requested quite a lot at Netgalley. The winter months are great for the genre though! 😉 This one was really good; even better than S.K. Tremayne’s first title (The Ice Twins). Ooh I have this on my reading soon list (I got it from NetGalley). Glad to hear you’re enjoying it so far. I’ll look forward to your review. I’ve just finished it and it’s really good! I liked it even better than The Ice Twins. I hope you will enjoy it as well!